Overstatement, exaggeration and embellishment are vital components of our fishing heritage and culture. With a wink and a nod, we chuckle at what a bunch of good-natured rascals we are, telling all those stories like we do, as did our grandfathers and others who have gone before. Telling lies is a time-honored tradition of our sport and some of us find it no great insult to be called a pack of liars. Most anglers agree that a story can be made more enjoyable for an audience with a few minor enhancements. One can also distract from one’s own shortcomings — as well as the shortcomings of the fish — by adding a particular element here or there. For instance, that time a couple of seasons ago when I came back from the old beaver meadow claiming to have caught 109 brook trout, six inches long? An exaggeration by nearly half! Not more than a dozen of those fish were longer than my finger. 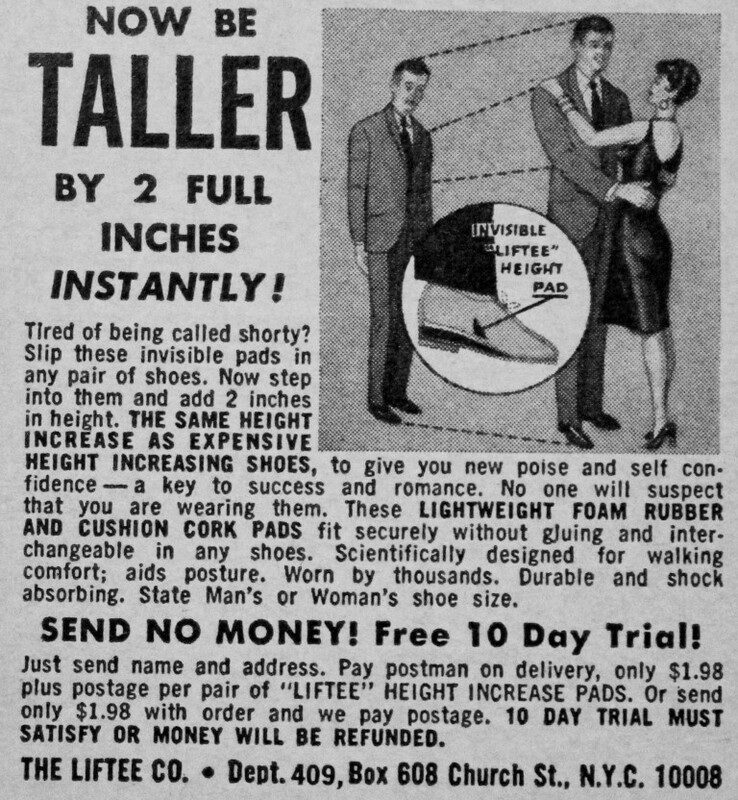 Of course, some folks are simply pompous blowhards in need of deflation and, in 1953, the Langley Corp. of San Diego was selling a product with an appropriate name, just for those who must fish with such people. 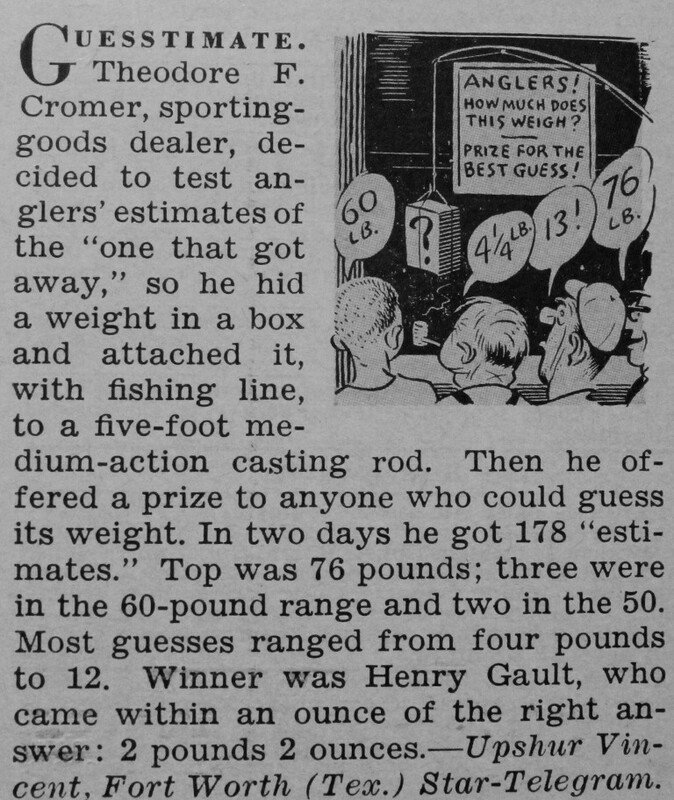 I don’t know how long the fun would last if you insisted on measuring everyone’s fish to check the accuracy of their estimates, although I can see how a scale and tape might settle an argument now and then. But most anglers I know don’t need such contraptions as, from what I can tell, they are pretty good at estimating the size of their fish to within at least six inches and a couple of pounds. Misjudging weight that badly could make a fellow feel downright inadequate, as if life isn’t already hard enough. Very few of my fellow fly fishers are as tall as I am and, in fact, some of them are actually quite short. Just as we may never know the actual size of the fish they’ve caught, they could be fibbing about other things, too, as shown by this ad from another old issue of Outdoor Life. Remember, fellow anglers, that even the best lines can become old and weak with over-use so, as another season on the water gets underway, our wish for you is to catch such a fish that, even in retelling the story, you need not tell a lie but, if you do, make sure it’s a good one! This (on the the heels of my “32-inch rainbow on a small Appalachian stream that got away” story) is perfectly timed. I’m ready. I read your story twice and I’m still quivering. Every year I think I’ve about got the water lines figured out but there are always surprises. Water is a ways off yet. Today was all about tossing 16 tons of snow off a roof. I envy those who fish this time of year. I really dislike my integrity being impugned before I even tell a story…well there were previous stories but this one is true. The 6-7lb rainbow that broke me off in New Zealand(guide’s estimate) honest. I would think your integrity was first impugned so long ago you’d be used to it by now. Some guides develop that uncanny sense where they can weigh a fish just by looking. Yours was obviously just such a person. We’ll toast that fish and your guide this spring. Then we’ll have a little chat about taking the word of guides. I attempt to be honest in my accounts as well. Go out enough and strange stuff will happen. Big fish will bite from time to time. I think a lot the the exageration is formed in the excitment of the catch. My first five pound bass seemed a lot larger than it was. After a few I became a lot better at telling the difference. I am not sayig I trust every story I hear or expect others to trust my accounts. All stories should be taken with a grain of salt, but I do not take well to being called a liar. I’ve always been surprised by how small a trout can turn or even pull (for a little ways) a 14′ row boat and I don’t say a thing when someone tells of breaking off a fish so big it pulled their boat. Until he sees for himself what a healthy 2-pound trout can do, that fish will always be a monster. I edited out a line about how, if you ask fishermen individually, each of us is a straight shooter and as honest as the day is long. You’re not a liar and I’m not a liar (just pretend, for the sake of argument) but “we” as fishermen see, feel, and do some things that some rational people might have a hard time believing when “we” relate the tale. Besides, “saw it, hooked it, landed it” ain’t much of a story. Your word is good enough for me. Great post, Quill. I relived some stories of past as I read each example you gave. Not only are “most” fisherman liars, the big one they always catch is “just up the bend in the river out of sight mind you”, or, “clear across the lake where no one ever fishes”. Told you they stirred up some memories! I think it is interesting how so many anglers who’ve never met know the same stories! A few comments: I had one of those De-Liars; I’ve had a few “big ones that got away,” and my humorous fishing stories involving my family and friends need no embellishments to make them funnier or more believable. 😉 A book in the making…someday! Oh, and speaking of liars, I saw Paul Milot in Westbrook, Maine, this past Tuesday evening; he came to my program at Sebago TU Chapter. I take it you’re not planning to be among Mr. Milot’s guests this year. Those base concepts will get you every time but I had to have a starting point for this post which, by the way, I am pleased you enjoyed. Hey, I’ve got one of those Langley contraptions! From the 60’s, I believe. I’m so honest, I’ve never felt the need to use it. Those things probably aren’t very precise anyway and can’t measure all the intangibles that make up the true size of a fish. Leave it in the closet. I saw three beaver lodges last week as I paddled around the lake. I thought of you and why so many people from “up there” are moving “down here.” In the end, I can’t blame them. With three feet of snow still on the ground, we have plenty if you want me to send you some to share with homesick Yankees or build an igloo or something. 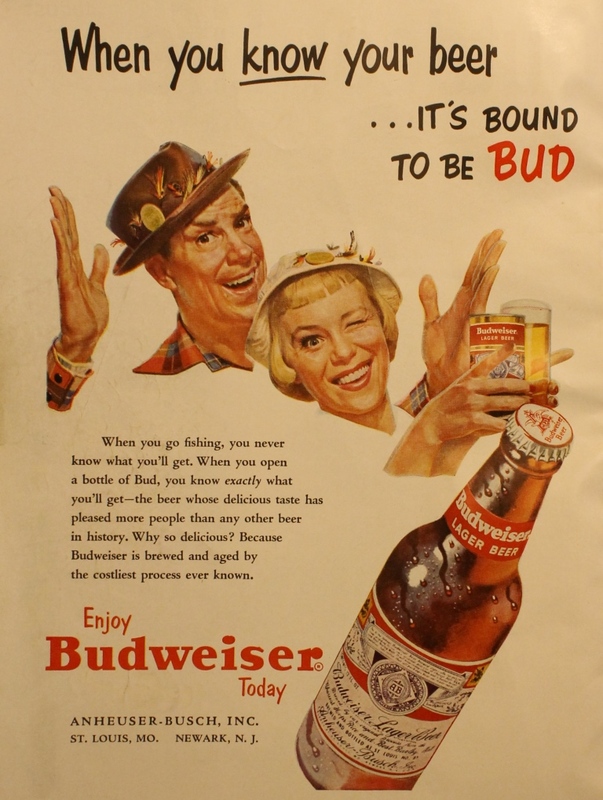 That’s a weird way to sell beer: “the costliest process ever known.” That’s like saying “we package products in the most inefficient way.” In any event, your post has served to make me want both a pint of beer and a plate of fried fish. I think it’s funny they make it sound like they went out of their way to use “the costliest process ever known” as if they had researchers working on just that. You make me wish I was where I could get a good plate of fried fish, preferably catfish. Guess I’ll have to travel south sometime. Fried smelt are tasty but they are small and crunchy. They do go good with beer, though.